Torsten is an Associate Professor of Computer Science at ETH Z\"urich, Switzerland. He is also a key member of the Message Passing Interface (MPI) Forum where he chairs the ``Collective Operations and Topologies'' working group. Torsten won best paper awards at the SC10, EuroMPI 2013, SC13, and other conferences. For his work, Torsten received the SIAM SIAG/Supercomputing Junior Scientist Prize in 2012, the IEEE TCSC Young Achievers in Scalable Computing Award in 2013, and the Latsis prize of ETH Zurich in 2015. Following his Ph.D., the received the Young Alumni Award 2014 from Indiana University. 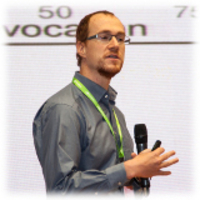 Torsten was elected into the first steering committee of ACM's SIGHPC in 2013. He was the first European to receive those honors. In addition, he received the Best Student Award 2005 of the Chemnitz University of Technology.